This week: Cree's new BR30 flood light, two ways to light an airport, and yet another lighting technology competitive with LEDs. Last week, we nodded to hydrargyrum medium-arc iodide (HMI) lighting, and its use in film and photography. This week, we mention another technology that comes even closer to matching some of the advantages of LEDs -- in longevity and efficacy -- and produces high-intensity, point-source light that directors of photography love. This is plasma light, generated when radio-frequency energy is concentrated on a gas inside a quartz tube. Plasma light is full-spectrum, mimicking sunlight, and its CCT can range from 4500K on up. Plasma lights take a minute or so to turn on, and perhaps even longer to re-ignite after being turned off ("hot re-strike"). Applications range from street lighting and high-bay to architectural, entertainment, and horticultural lighting. Some of the companies making plasma light engines are Ceravision, i-Giant, Luxim, Plasma International, and Topanga Technologies (which has a roadmap that claims that lumen efficiencies will soon reach 150 lm/W). Hive Lighting makes portable luminaires based on a Luxim plasma light emitter, targeted at the film, television, and advertising markets. It claims a CRI of 94 for its lights and a lifetime of 30,000 hours (though changing out the light engine is recommended at 10,000 hours to maintain absolute color consistency). Here's a perspective on Hive Lighting's products from the director of photography for Joss Whedon's Much Ado About Nothing, which was filmed in 12 days entirely in Whedon's house in Santa Monica. Cree has introduced a new consumer product, a BR30 flood light to complement its A19 bulbs. Like the earlier bulbs, they can be purchased at Home Depot. The company touts the conventional look of the BR30, claiming it can be mixed and matched with tungsten lamps, replacing them incrementally as they burn out, with no inconsistency of appearance. The new dimmable lamp consumes 9.5 Watts and replaces a 65-Watt incandescent. It is designed for track and recessed lighting fixtures and is UL-approved for damp conditions, so it's fine to use in a bathroom (but not outdoors). 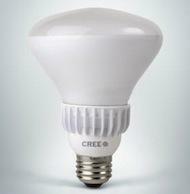 Cree has priced the 2700K version of its BR30 just under $20, and the 5000K version $2 higher. These prices are competitive with, and a little lower than, prices I can find online for equivalent GE and Philips bulbs. DesigningWithLEDs.com has a review and teases an upcoming teardown of Cree's BR30; I'll be watching for that. The reviewer for Illumination in Focus believes that the light tower and base electronics are similar or identical to those found in Cree's A19 bulbs. We wrote about a project to rework the lighting in a terminal at Boston's Logan airport. Here are two more airport applications of LED lighting in the news this week. Schiphol airport in Amsterdam is replacing thousands of signs along its runways, currently illuminated full-time by halogens, with ones lit by LEDs. The signs inform pilots about runway numbers, routes, locations, and airport traffic rules. The airport expects to save 70 percent of the energy used in lighting the signs. And in the US, at Detroit Metropolitan Airport, two airport parking structures are being upgraded with LEDs -- 6,050 210-Watt metal halides are being replaced with 7,200 Cooper low-bay LED fixtures running at 60 Watts. The lights will be outfitted with smart controls for additional savings through daylight harvesting and activity sensing. When the $6.2 million project is complete next year, the airport expects to save two thirds of the energy used to light the parking structures. The reduction in heat load [vs. incandescents] meant smaller air conditioning ducting, which allowed lower studio ceilings, which required less steel. That meant less overall weight, which also allowed a reduction in concrete in the foundation. 'It was a substantial savings, above and beyond the ongoing energy savings,' said Marchitelli.